I really wanted to see the pink dolphins–one of the few freshwater dolphin species after reading Sy Montgomery’s book “Encantado: Pink Dolphin of the Amazon.” I booked a tour to the Peruvian Amazon lodge she stayed at with visions of swimming with pink dolphins. Unfortunately, during 2010 that portion of the Amazon was experiencing a severe drought and the pink dolphins were pretty scarce. One of the side trips on this tour was to see the poison dart frogs. I have always been fascinated with Amazonian frogs. I think my first issue of “Ranger Rick” had an Amazonian tree frog on the front cover. If I wasn’t so crazy about birds, I would have been a herpetologist. I thought it was cool that the indigenous Indians utilized the poison substance, a curare-derivative, in their poison arrows. I thought about that a lot when I used a synthetic curare. derivative while taking care of my post surgery open heart patients. And so, I set off for the 6 mile hike to see the critters. My guide was a bit cocky and not too communicative. I strapped my twenty plus pounds of camera gear and filled my lone water bottle. I barely noted that he packed two bottles. Off we went into the Amazonian jungle. It was an easy hike in terms of terrain–mostly flat. However, as the morning wore on, I was guzzling the water at a rapid rate to make up for my evaporative water losses. I saw some great things on the trail–a bicolored hawk, a wire-tailed manakin, and other birds. However, upon arrival to the village where the poison dart frogs lived, I was clearly experiencing the early stages of heat exhaustion. My cortisol levels barely rose when the guide told me that a Bushmaster, one of the most deadly of snakes, had been seen the previous day on the same trail leading to the forest where the dart frogs lived. 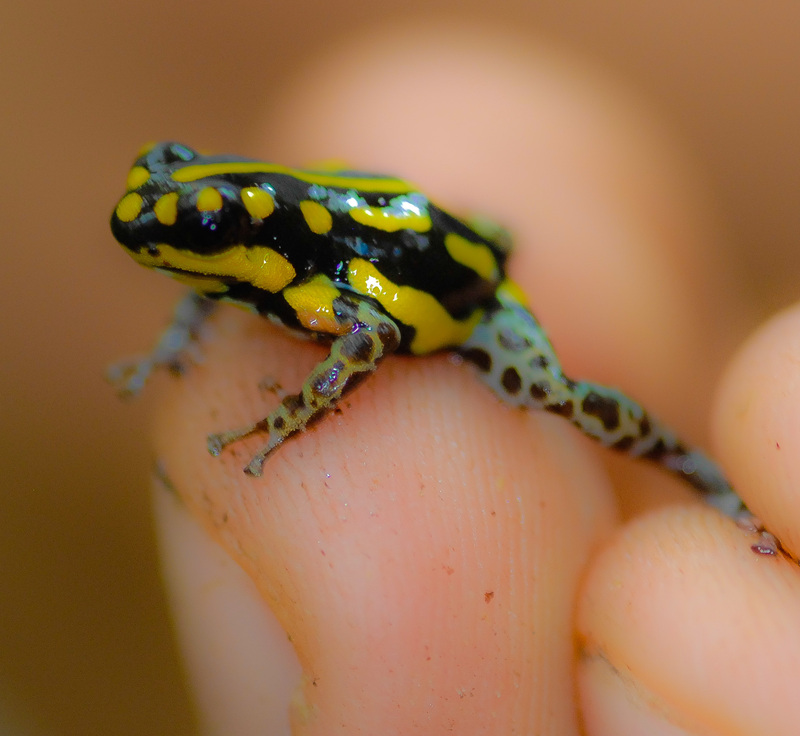 We eventually found one of the two species of dart frogs. However, at this point I was clearly delirious. I could feel that I was hyperthermic and my heat stroke symptoms would have progressed further had not a light rain started and I was able to lower by temperature by getting soaking wet. This was, I thought an all time low. I am in the middle of the jungle with an insensitive macho guide, a loose Bushmaster, and an exhausted water supply. It couldn’t get much worse. I knew that I could not walk the three miles back to the lodge and was pretty certain that my guide would not carry me. I spied a lone canoe and asked the guide if the canoe could take me back to the lodge. He nodded yes. I asked him to find the canoe’s owner. I told him I would give the owner twenty dollars to row me back to the lodge. I felt nauseated and more delirious. I was becoming hyperthermic. In what seemed an unusually long absence, the guide appeared with the canoe’s owner. 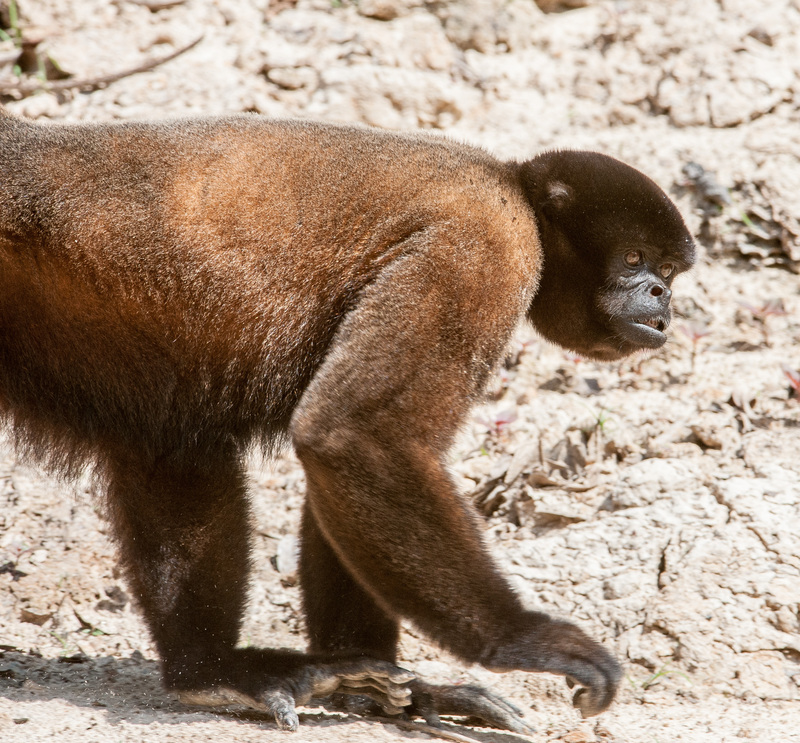 In the background I saw a lone Woolly monkey in the tree on the other side of the river. She was making some monkey sounds. I took some photographs of her but they were long shots that I did not expect to come out too well. We got in the canoe and pushed off. Suddenly the monkey came down and started running towards the canoe. Her vocalizations became louder and her body movements more aggressive. She started to run along the canoe. 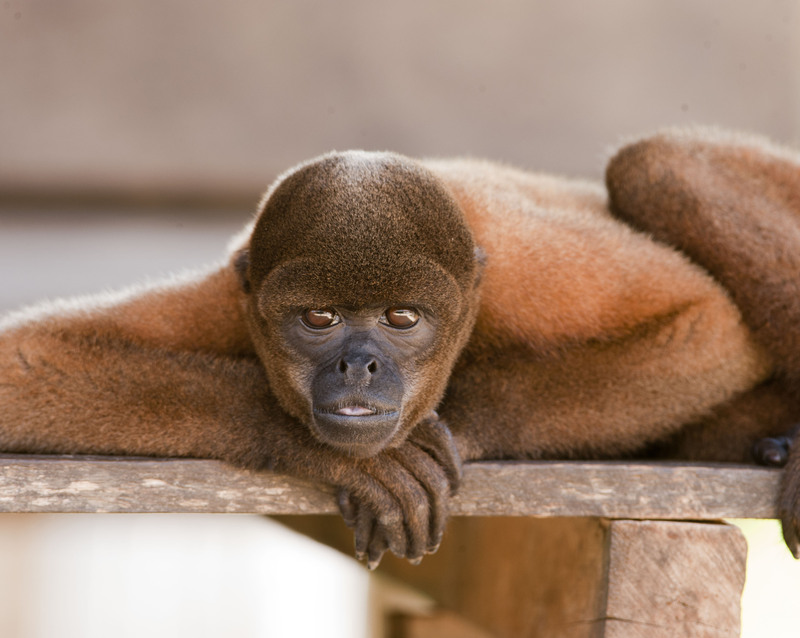 The Woolly Monkey, in this instance Poeppig’s Woolly Monkey (Lagothrix poeppigii) is a monkey with a restricted range to Ecuador and Peru. It is a robust species with males weighing as much as 10 kg. It is mainly vegetarian and occasionally eats frogs. The species is threatened. In this region, they are often taken as pets. The guide urged the boatman to row faster. Despite the low water levels, the current carried us away from Drosilla. The guide informed me that Drosilla was a repatriated pet. She usually is well-behaved. However, sometimes she gets jealous of a lone female who she views as competition. The group who visited the area the next day (carrying bananas) remarked that she was the model of correct behavior. This entry was tagged Amazon, nature, Photography. Bookmark the permalink.